The Centerville-Washington Park District has acquired another high-quality natural habitat for residents to enjoy. The 32-acre parcel of land is located at the end of Zengel Drive, adjacent to Pleasant Hill Park. The acquisition of park land was made possible by the Clean Ohio Fund—Green Space Conservation Program. The Park District received an $803,250 grant to cover 75% of the acquisition price and initial land conservation efforts. The new park land will remain largely undeveloped. The Park District envisions the addition of pathways and trails with environmental interpretive signage, as is typical of nature preserves. Consistent with this type of park land, use will be primarily self-directed. Park District sponsored hikes and nature education programs will be occasionally scheduled at the preserve. Thanks to the Clean Ohio Fund grant funding, the Park District will be able to begin aggressively removing non-native invasive plant species, such as honeysuckle, and fell dead or dying trees that could be a safety concern. “Our mission is to preserve quality tracts of land for our community to enjoy now and well into the future. 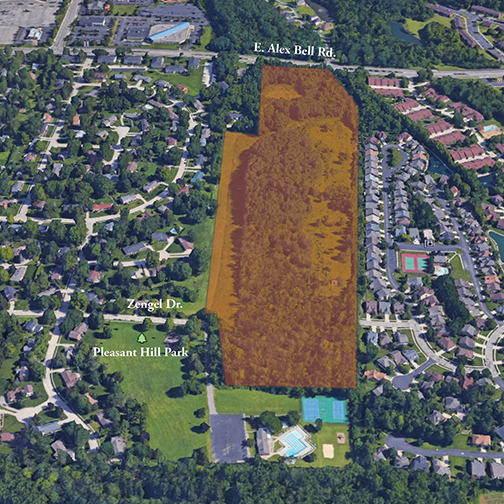 This piece of land fits in well with our strategic focus and allows us to respond to the community’s desire to preserve open space in Centerville and Washington Township,” said Dan Monahan, President of the Board of Commissioners.